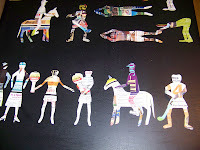 Last night, I arranged my cutouts in a row so I could decide if that was the way I should use them - and it is. 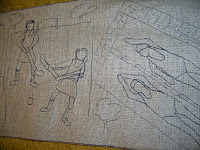 I traced them onto linen today and the pattern is now 15" x 70". 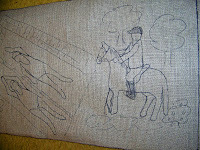 I put a horse at each end, one with a taller rider, the other with a shorter rider. 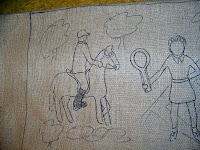 So, we have a horse on the left, followed by a tennis court with two tennis players. 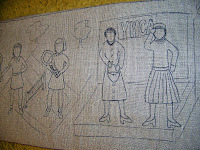 Then the two who are dressed up are standing on a stage - a stage at the YWCA - they are participating in a fashion show. Your figures all look great! I Like to colour plan as I go too! Great idea. 70 inches! That's a lot of rug! Will look forward to your progress. I loved your "junk mail" templates. I'm sure you will enjoy the memories of your friends that will emerge as you hook on your rug and think about them. I really am enjoying thinking about the "old days" while I'm hooking on this rug - I am really glad we had a reunion last year. Seventy inches does seem long in theory, but if I hook a motif a day, I think it will go pretty fast, unless I get stuck on color planning.